Experts from various backgrounds including economists suggest that innovation is a must in order to better create high-quality products and results and to improve humans’ life in all aspects, and the successful innovation determines international competitions among countries nowadays (OECD 2007, p. 3). However, in the process to innovate, we might somehow face two different possibilities whether it works or fails. It is, of course, satisfying when the effort that we have made produces new significant and beneficial changes, but failure also means that we need to take more steps ahead to reach the success we have expected. I myself once remember powerful words that say: “never learn to succeed from success stories”. This simply means that success stories merely tell us about happiness, but we often overlook that behind that glory there are untold and hard moments as well as trials and errors. Thus, it is better for us to learn more about the power of failures before reaching the top of success. To begin the first idea around the failure, I would like to use the principles written in the best-selling book “The Power of Failure” by Charles C. Manz, a Professor of Business Leadership Management. He begins by introducing an old and new definition of failures. Traditionally, failure means “an inability to perform and a lack of success”, but in a modern perspective, it is “a stepping-stone to success and an opportunity for learning and development as well as creative change and innovation”. He further emphasises that “[t]oday’s failures contain the seeds of tomorrow’s greatest successes”. Inventors and the world’s most well-known figures, such as Thomas A. Edison, Henry Ford, Einstein and many others, in the past, lived their life by experimenting new ideas and failing over and over again until they were finally successful. Their advice of being successful from failures are nowadays used by leading companies in the world. Even in another best-selling self-development book, The Law of Success in 1928, Napoleon Hill highly encouraged us to face failures and take granted from them. The idea of failures was written in one particular chapter to remind us that failures are a part of the journey to success. Another compelling perspective is from John C. Maxwell who wrote: “Sometimes You Win, Sometimes You Learn”. This book is one of the most-recommended books to read for entrepreneurs before starting their businesses, teaching us to be mature and wiser by learning from mistakes. However, in order to properly benefit from failures, there are many aspects we should notice and learn. Winch (2014) suggests there are “Four Keys to Learning from Failures” published on the Huffington Post Online. He stated that “[t]o be able to learn from our failures, we need a way to decode the “teachable moments” hidden within them”. He advises us to do three sorts of re-evaluation, including planning, preparation, and execution, and to focus on the control. It is all true that before taking an action we should carefully prepare it, especially when we once failed. I also remember what Benjamin Franklin said “fail to plan, plan to fail”, and those simple words should have had a deep meaning on us. Moreover, in order to completely learn from failure when working with our innovative ideas, we should persistently keep trying and not stop till we eventually succeed. 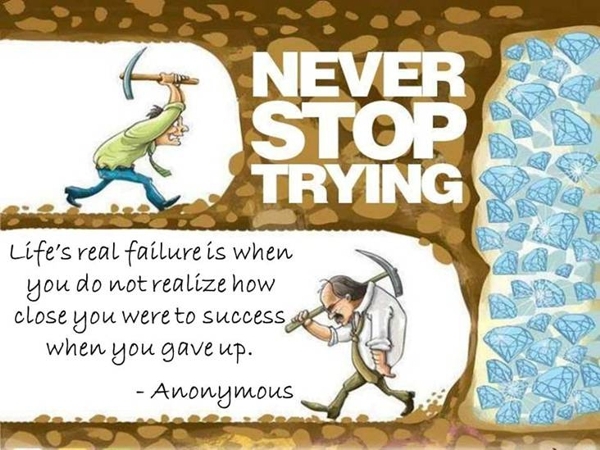 See The Power of Persistence. Note: This article was written for the 3rd Blog Entry of “Innovation (ED5009)” unit, Master of Education, Victoria University, Melbourne – Victoria, Australia.